In today’s computing world, developers are increasingly resorting to the cloud’s reliable and highly scalable infrastructure to build, test, and deploy apps. Over four million apps now trust and use the cloud as platform. You should try it too! 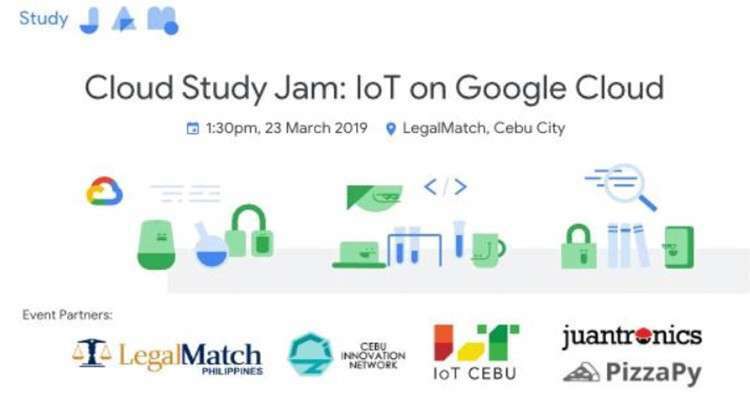 LegalMatch Philippines, Inc. (LMPH), a developer of software applications for the US legal industry, will be hosting a free training and workshop entitled “Cloud Study Jam: Iot on Google Cloud” this coming March 23, 2019. The training will be held at LMPH’s office at the FLB Building, Cebu Business Park. The event will start at 1:30 PM and will culminate at around 6 PM. Cloud study Jam is for those who want to learn the fundamental tools and exciting capabilities of Google Cloud. This training is for free and is intended for professionals as well as Information Technology, Computer Science, and Computer Engineering students. Attendees can expect to learn how to integrate their IoT projects to Google Cloud. They will also get free access to Qwiklabs, an online training tool that can be used to create live servers without the need for a credit card. Facilitators will be there to guide in their study exploration. This event is organized by Brian Tan Seng of GDG Cloud Manila in collaboration with PizzaPy Cebu, IoT Cebu, Juantronics, the Cebu Innovation Network / Innovation Island Community, and hosted by LMPH. Startup founders Karl Acha and Christy Canete of Juantronics will also be there as facilitators to point attendees in the right direction if they have no IoT projects yet. Those who are interested can register at https://www.meetup.com/GDG-Cloud-Manila/events/259122076/. The organizers are also looking for facilitator volunteers who will help guide participants during the workshop. Volunteers may or may not have experience with Google Cloud tools. They will be given access to lessons in advance. Those who want to volunteer can inform LMPH as early as now. This is the second training and workshop that LMPH had for this year. Last year, the company successfully organized and hosted a number of IT-related trainings and workshops. These include Agile Essentials, Project Management, and SEO.